Melt 1 tablespoon of coconut oil in a small skillet on medium heat. Add blueberries and sauté, stirring frequently, for a few 5 minutes until berries release some juice. To make the cobbler topping, combine almond meal, oatmeal and salt in a bowl. In a separate small bowl, whisk together vanilla extract, agave and remaining coconut oil. Mix the wet and the dry ingredients together until just combined. 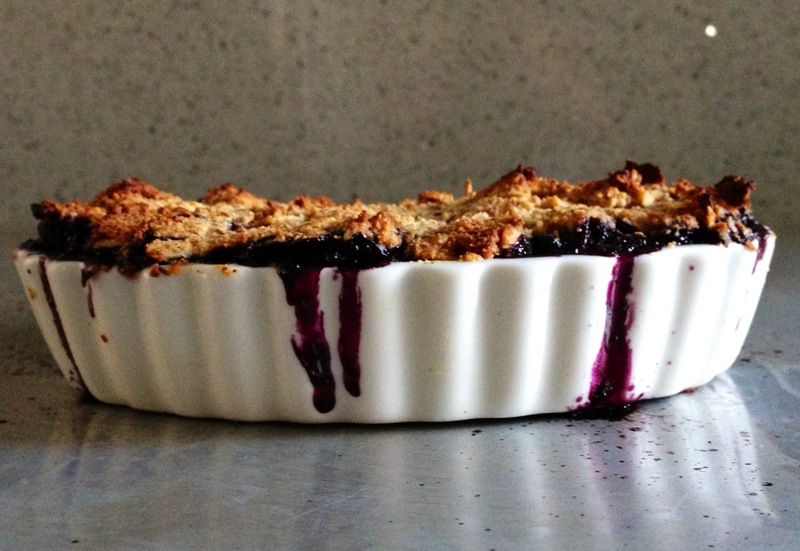 Add sautéed blueberries to a greased ramekin and top with almond oatmeal mixture ( the topping will be moist, so you may need to use a flexible rubber spatula to spoon mixture over blueberries). Place ramekin on a cookie sheet and bake in the oven at 400F for about 20 minutes, or until the top is cooked, crisp, and slightly browned. Let cool for 5-10 minutes.